such sweet longing…my heart echoes your words…and the words ‘each new in You dressed in blue’…will the day be blue? or maybe You? or maybe even the seeker? No matter…there is only the single aspiration, the inner breath of a flute…longing. Blessings and much love to you, my dearest, sweet soul-friend! In Hinduism, we do believe like many other religions in one formless omnipotent omnipresent God. But we also believe this Supreme Divinity appears in form — kind of like how Catholics worship Jesus, as the son of God….so we have many forms of God and we love to adore Them in different ways. My Divine Beloved in Blue — symbolizing eternal expansiveness. So the last line – Drenched in Blue — referred to being drenched in the Blueness of my Lord….not blue in the way we use in English. Sorry, i hope this makes some sense, my sweeeet travelling companion. And shouldn’t you be sleeping now? Sending you prayers for good rest and a beautiful day tomorrow. Yes, I took ‘blue’ to mean something like expansiveness, so fear not. And I am sleeping much better, thank you sweet Krishnapriya, with much more energy when I need. Blessings of sweet smiles to you, with hugs galore and a yellow butterfly! So happy to hear that! Take care of yourself precious singing child. Much love and dancing hearts. I feel you in my cells – Thank You – I haven’t been here in many days and what a way to reconnect in the New Year! Happy New Year! Thank you for coming by here – your visits bring so much light and encouragement. Grateful and happy. 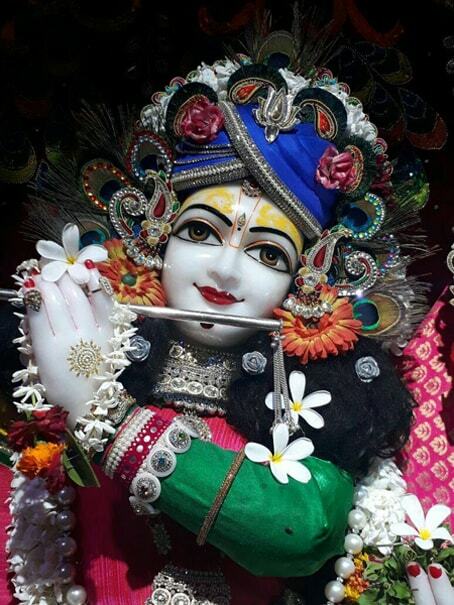 To dance to the tune of his flute…ah… absolute divine bliss. Thathastu to this lovely wish Krishnapriya! Infinite is the strength of divinity.🙏 How beautiful it is when our aspirations become inspirations to the world at large ❤.